The Hoatzin (Opisthocomus hoazin Müller 1776) belongs to the class Aves, order Opisthocomiformes, family Opisthocomidae. Local names. Peru: Hoazin, Shansho; Guyana: Sassa; Venezuela: Chenchena; Colombia: Pava hedionda; Bolivia: Serere; Brazil: Cigana, Catingueira. The generic name Opisthocomus comes from the Greek opisthen (οπισθεν) = behind, in the rear and kome (κομη) = hair, tuft, and refers to the most striking characteristic of the plumage of the bird, that is the facing backwards crest. The hoatzin is a monotypic species whose taxonomical position has been discussed for long time ans is still uncertain. Since when it has been described for the first time, by Müller in 1776, there have been more disputes about its systematic position than for any other bird. As a matter of fact, Müller initially did classify it as Phasianus hoazin, hinting an affinity to the Galliformes. Later on, it was considered similar to the Cuculiformes, to the Tinamidae, to the Cracidae, to the Columbidae and to other groups. In the most recent years has prevailed the tendency to consider it similar to the Cuculiformes, even though this is contested by many scholars. The difficulty is surely due to the fact that the hoatzin, from a morphological point of view as well as from the behavioural one, is not easy to place in any of the groups of extant birds. It is likely that this bird has faced for long time an independent evolution, maintaining some primitive features and evolving other ones more specialized. Until very recent times therefore it has been object of discussions for defining what might be the closest relatives of this bird. Most taxonomists nowadays tend to consider the existence of a separate Order, that of the Opisthocomiformes, with only one genus, Opisthocomus. Only in 2014 the analysis of the complete sequency of the DNA has allowed to insert the Opisthocomiformes in a clade (evolutionary branch) close to those of the Gruiformes (that is, related to cranes) and of the Charadriiformes (that is, close to the seagulls or to the plovers). 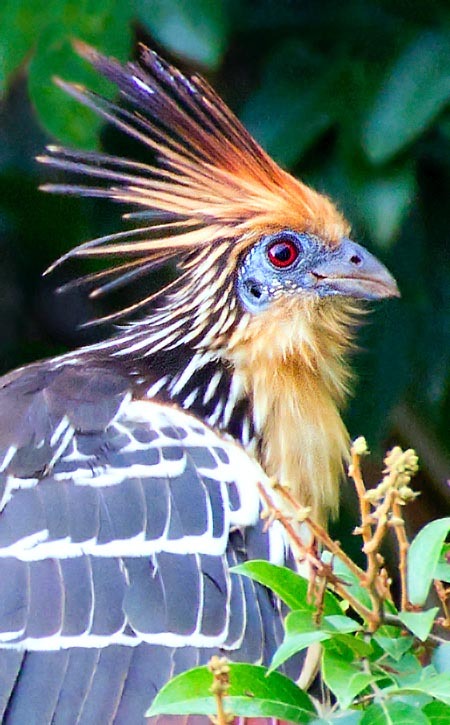 The fact that the nestlings of the hoatzin present two nails on the wings and that the ancient feathered dinosaur Archaeopteryx, that has been considered as a potential form of transiction between the dinosaurs and the birds, had three fingers equipped with nails on each wing had led in the past some scholars to believe that the hoatzin should come from the Archaeopteryx, and that it was to be considered as the most primitive among the extant birds. 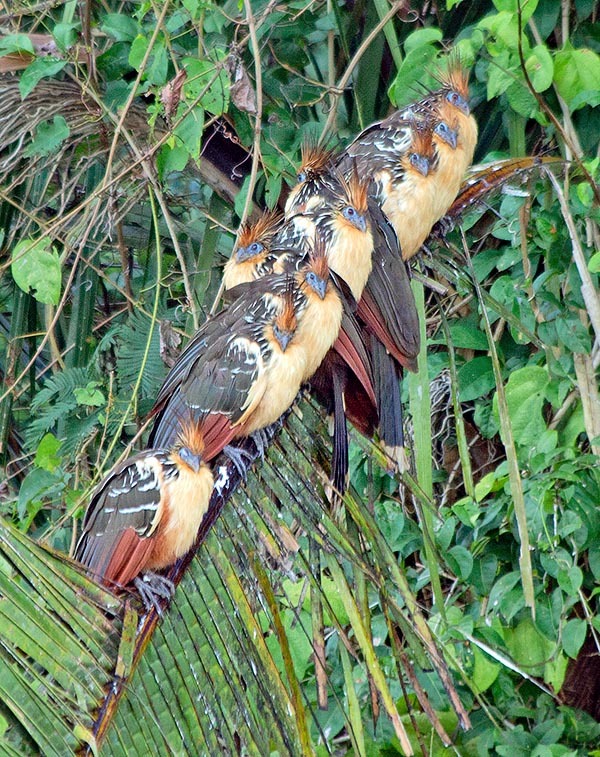 Actually, nowadays it is thought that the nails of the young hoatzin have had a more recent origin and represent a secondary adaptation related to the fact that the nestlings, before learning to fly, often need to leave the nest and to climb the bushes for protecting from the predators, utilizing the nails for this purpose. Fossile forms similar to the hozatzin dated from the late Eocene to the early Miocene have been found in Wyoming, in Argentina, in sub-Saharan Africa and in France which suggests thet for the past the distribution area of analogous forms had to be bigger than the present one. The distribution of the hoatzin is exclusively east to the Andes, in the Orinoco and Amazon River basins and in the costal zone of Guayana and of Surinam. The characteristics of the water, fresh, brackish or salt, are indifferent, seen that the birds adapt to nourish of numerous different vegetables. In the coastal regions the species is often associated to mangroves (Avicennia). 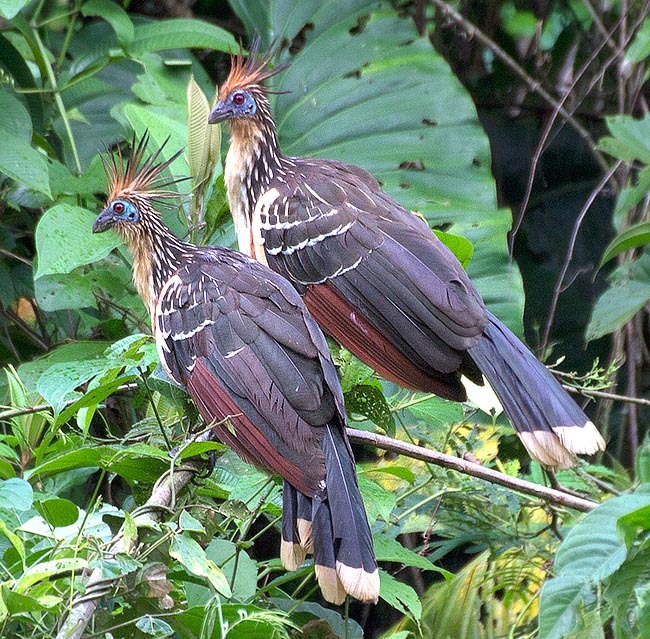 The hoatzin habitat is limited to the riparian vegetation of the neo-tropical lowland regions, in a belt of altitudes from the 5 and the 300 m, even if rarely some specimens have been sighted up to the 500 m.
The habitat requires a dense vegetation associated to the water, drooping on silty rivers, relict bends, lagoons and pools. This dense vegetation furnishes the bird all what it needs, including food, shelter and nest. Inside habitats with these characteristics the hoatzins distribute in an irregular way, with high concentrations in some zones, whilst other ones, apparently smilar, are ignored. 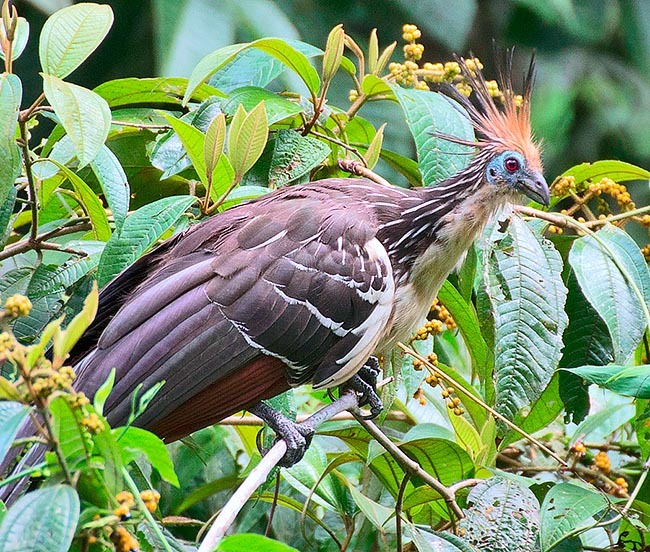 The restriction of the habitat of the hoatzin to thick trees, to the climbers and to the shrubs that border the waters of the plains of the Neotropic regions is likely a consequence of the evolutionary choice of the bird for a diet based on leaves and of the consequent type of digestion. This has led to the anatomical changes necessary to host the big anterior intestine and to the slow digestion, factors contributing to limit the capacity of movement with its behavioural consequences. The hoatzins are highly social all over the year and at times are seen in numerous groups of more than 40 specimens. Two adults at times perch in close body contact. During the coupling season the birds occupy small exclusive territories even if strictly close each other, whilst during the non-reproductive period they live in great mixed groups. 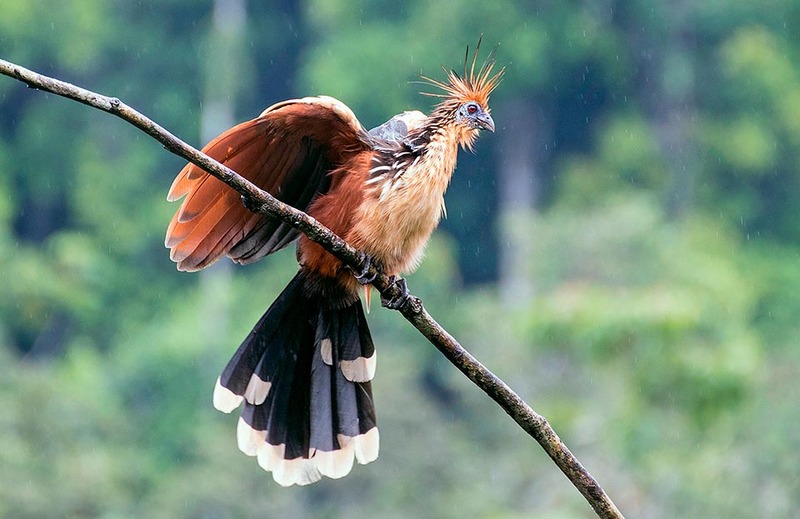 Often, when it rains, the hoatzin expose themselves to the rain opening the wings and ruffling the feathers, then dry up turning the back to the sun and stretching the flight feathers. It is possible that these behaviours, along with the habit of cleaning the feathers with the beak serve to eliminate the numerous ectoparasites. There have never been described behaviours of reciprocal cleaning, in spite of the great number of ectoparasites these birds host. The study of the parasites infesting the hoatzins has evidenced specific forms for this bird as well as forms shared with other birds of the same habitat, but the hope of finding precise correlations with parasites of other species in order to analyze possible relationships was not successful. The hoatzin overall look, as well as its size, leads to think to a pheasant. The narrow rust coloured tuft, 4-8 cm long and rigidly erect, with the well parted feathers, along with the red eyes, the protruding eyebrows and the ample bare blue area covering part of the beak, the orbits and the face, up to include and pass the ear, contributes to give an odd and surprising image. The overall look is well helped by the remarkable size, with long tail and long neck surmounted by the small head and by the fact that the bird, often associated in groups, leans looking out among the leaves with suspicious and little malignant expres- sion, careless of the presence of man and emitting its disconcerting voice. The feathers of the back are mainly of bronze-olivaceous colour, with paler spots, whilst the wings are partially of the same colour as the back and partially brown, but with paler feathers extremities. Chest and neck are pale brown-chestnut, whilst the body under the wings is brown, as well as the long rectrices that, however, have clear estremities. The beak is short, laterally compressed, black or olivaceous, as well as the robust legs and the feet. The two sexes are similar. The adults have a weight of about 700-900 g for a total length of about 65 centimetres. From an anatomical point of view, the most peculiar characteristic is the morphology of the anterior portion of the digesting apparatus, that has a development bigger than that of the stomach. In fact, the goiter is big, and is divided in two cells, and the esophagus, back to the goiter, is also convoluted and much developped. The goiter and the esophagus of the hoatzin, with their contents, are responsible of the 25% of the weight of the bird and determine several aspects of its behaviour and of its anatomy. Conversely, the stomach and the gizzard are less developped than in other birds. These features are in relation to the quite peculiar feeding modes of this bird. In order to create place for the big goiter, the sternum is highly reduced, with following reduction of the flying muscles that are rightly inserted on the sternum itself. This affects the flying capacities and therefore the hoatzin limits usually to short and clumsy flights. In case of need, the bird can fly even for 350 metres, but usually limits to much shorter movements. The hoatzins cling to the branches with the feet and can perch like the other birds, but usually, during the digestion they use as additional support a callous present on the sternum. Unlike adults, the young hoatzins are good swimmers, but they exploit this capability only as a tactic to escape predators. Neither adults nor young, in spite of the strong legs, have the habit of walking on the ground. The hoatzin anatomy and the limited capacities of movement may be a consequence of its alimentation based on leaves and buds of difficult and slow digestion: poor fliers, not swimmers and mediocre climbers, they probably stand among the birds having a most limited spatial range. Also the social behaviour is influenced by these habits. As the hoatzins spend the life moving inside the thick arboreal vegetation, they show with remarkable frequency consumed or damaged feathers, this is particularly evident in the tail, where the tips of the feathers are often broken or missing. The moulting in the adult occurs after the reproduction period, that is by the beginning of the dry season. The hoatzins have a bad reputation due to the odour they emit, to the point that in some South American regions they are called “stinking birds”. The odour, that comes from the fermentations made the bacteria living in symbiosis in the goiter and esophagus, has been variously described as of mold or of fresh bovine dung, even if some observers relate not to have perceived particular odours. It is possible that the differences come from the type of leaves the bird nourishes of. The hoatzins are noisy birds and often many individuals cry in unison accompanying themselves also with the shaking of the wings and of the tail. The repertoire of sounds is quite vast and includes hoarse cries, grunts, growls and mainly hisses. The most common cry is a harsh murmur that is usually emitted in presence of intruders. (When walking at dusk in the forest nordering a pond, the first meetings with a group of shansho are disturbing). In the past it was thought that the hoatzins nourished only of leaves of Araceae and of mangroves of the genus Avicennia. Nowadays, we know instead that they nourish of various tens of different plants, of which they can assume the leaves, the fruits or the flowers. However, usually their diet is mainly composed by few species, among which the trees of Fabaceae, of which they consume the buds and the young leaves (it is to be noted that many of these species do contain toxic substances). 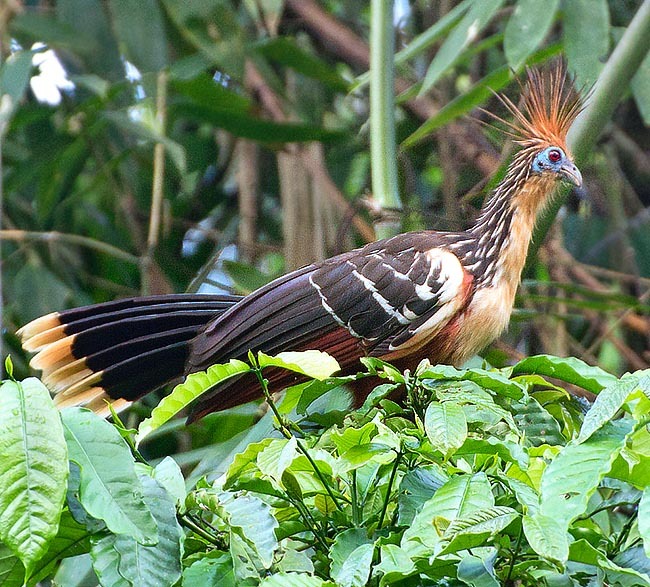 Since the aliments of the hoatzin are mainly formed by cellulose, molecule that cannot be attacked by the animals digestive enzymes, this bird, as well as other herbivorous animals, exploits the enzymatic activities of an abundant symbiont bacterial flora localized in the great goiter and in the esophagus that, as we have seen, is much developped. The bacteria, provided of the suitable enzymes, break down the cellulose producing molecules that can be utilized by the bird, similarly to what happens for the ruminants or for the horses. The goiter and the esophagus of the hoatzin have a thick and rich of muscles wall and the inner surface is pleated and covered by corneal tissue. In this way with its movements it can shred the leaves and facilitate the action of the bacterial enzymes. Thanks to the presence of valves the transit of the food through the esophagus is very slow and this allows a complete digestion. Besides digesting the cellulose and other components of the food, it seems that the bacterial flora carries out a major function in detoxifying dangerous substances and also synthesizes some vitamins necessary to the bird. The bacterial fermentations occurring in the goiter and in the esophagus are responsible of the production of the gases that confer the hoatzin its typical bad odour. The efficacy of the bacterial flora in digesting the vegetal aliments is very high and this has stimulated several studies on the symbiont bacterial population. It was found that are present about 1700 different species of bacteria, belonging to 9 different phyla and for the most part (94%) previously unknown. The scientific interest towards the bacterial flora of the digesting apparatus of the hoatzin is very remarkable. In fact, it is thought that the bacteria with detoxifying action could be isolated and transferred to domestic mammals of zootechnical interest, rendering them able to feed without any risk of toxic vegetal species present in the ambient. A further development might be that of exploiting these bacteria or the enzymes produced by them for industrial processes of transformation of vegetal biomasses, such as, for instance, the production of fuels starting from vegetable residues or waste paper. Usually the hoatzins begin to reproduce starting from the third year of life, or, less often, from the second one. The rare matings during the first year usually produce sterile eggs. The average lifespan is of about eight years. The reproduction occurs during the rain season. The hoatzins live in stable social groups formed by 2-8 individuals: the most common case is that of two (the pair) whilst the cases over the 5 are rare. The adults in excess are subadults and “helper” adults, usually the young of previous broods of the pair. The helper collaborate in all the breeding activities, except, obviously, the coupling and the deposition of the eggs. Only in rare cases the helper can be “immigrants”, that is, not sons of the reproducing couple. It has been proved that the presence of the helper increases the probabilities of survival of the nestlings. These social units defend small well defined territories along the whole reproduction season. The are two types of mating: one of exhibition that appears to have the function of deterring potential male intruders, and one reproductive. The exhibition matings and also the vocalizations accompanying them are shorter than the reproductive ones. The nest is an irregular 30-45 cm platform, built with twigs or dry leaves and placed in thick shrubs. The nests can be utilized for several years. Usually are laid 2-4 eggs, oval or elliptic, white dotted of brown or light blue, of about 4,5-3,3 cm. The hatching lasts about one month. If the coupling has been precocious in the season, sometimes, though rarely, a second deposition may occur. The nestlings are nourished by the parents or by the helpers for about three weeks. The parents or the helper adults feed the chicks regurgitating the partially digested leaves, thus furnishing not only food but also the bacteria that will colonize the digesting apparatus. The chicks ask for the food pecking the parents beak and emitting acute chirps. Since the third-sixth day the chicks are able to get out from the nest and jump into the water in case of danger. They are able to swim and then to climb the branches for getting back to the nest, exploiting the nails present on the wings and helping themselves with the feet and the beak. The young begin to leave the nest when 2-3 weeks old, but are nourished by the parents up to about two months. 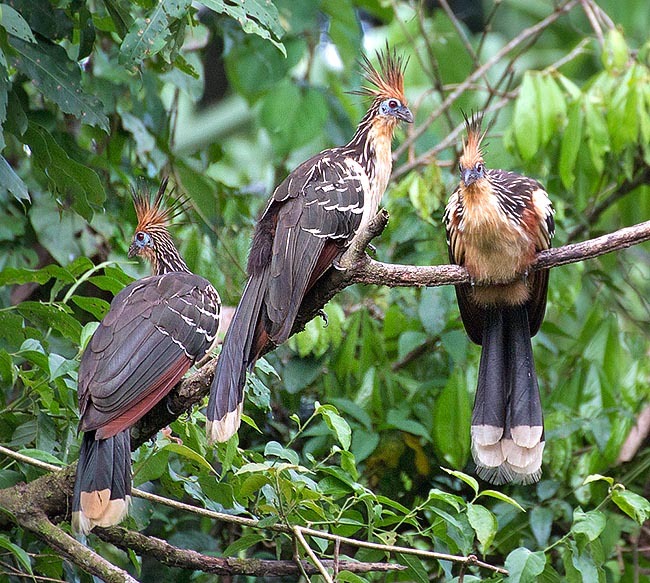 The nests of the hoatzin are object of predation by several animals. The weeper capuchins (Cebus olivaceus) predate often the eggs and various birds and mammals such as the opossums, the raccoons and the ocelots and also the ants do attack the nestlings. Some studies suggest that more than the 50% of the hatchings does not survive. Various tribal populations of natives of the Amazonic regions collect the hoatzin eggs to eat them. The feathers are utilized as ornament, for medicinal purpose or as baits for fishing. Thanks to the typical bad odour of this species the natives do not eat them unless in cases of extreme necessity and this fact has by sure contributed to protect it against the intensive hunting, in spite of its ineptitude to the flight that renders it very exposed. The American zoologist C.W. Beebe, who has sampled the flesh of the hoatzin, has found it tasty like that of other birds, suggesting that the bad odour is limited to the goiter contents. The hoatzin is Guyana national bird. As the natural habitat of the hoatzin extends over an immense area of South America, the total population is probably very large and therefore the species is not considered as endangered. For the future the biggest risk is represented by the quick disappearing of its habitat that is destroyed at very high speed due to the deforestation and the conversion of the territory for agricultural use, in particular to rice fields. The large-scale projects of control of the water of the llanos of Venezuela, for instance, if realized could put in great danger the survival of the hoatzins in that region. Numerous attempts have been made for maintaining the hoatzins in captivity, in most cases without success. Some specimens have survived for some years, but only exceptionally have been obtained reproductions in captivity. 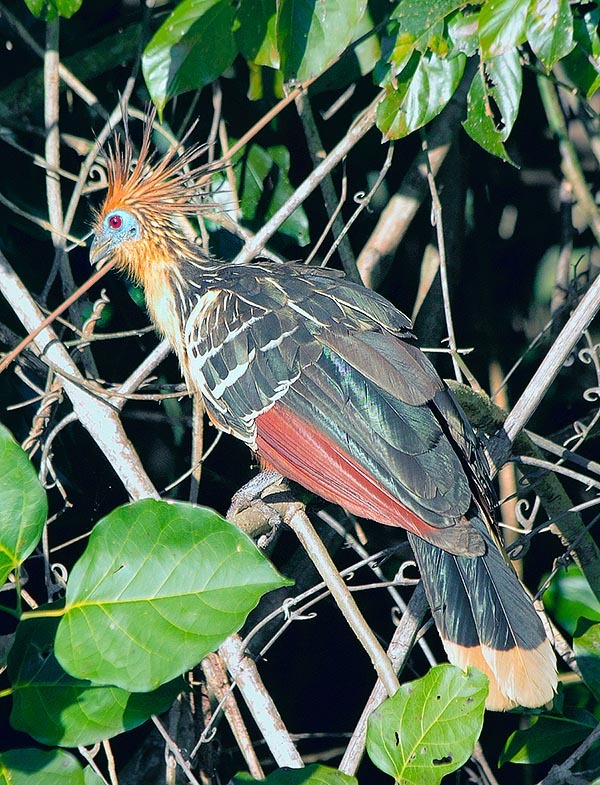 A video games character, Hurrican Hoatzin, has a crest of erect feathers and combinations of colours somewhat similar to those of this bird.